As soon as the village population began to increase from the 1860's, the earliest records show that the male population, in next to no time, embarked on organising their free time, often based at one of the local pubs. Games of quoits were played at The Artichoke, The Coach and Horses, The Duke of York and The Red House. The game was played by tossing rings of plaited rope or flattened metal at an upright peg, a game for individuals or as a team. The John Dickinson mill boosted the numbers of men in the village when employees were transferred there from the Apsley mill. They created their own sports club, established in about 1877, called The Croxley Stars Cricket and Athletic Sports. This was achieved with the assistance of the Mill manager, who persuaded the firm to acquire suitable land from Gonville and Caius College, Cambridge for this purpose, located opposite The Red House public house. A substantial club house was also provided and the whole enterprise was such a great success that it led to many varied sporting activities being taken up. These two photographs are believed to have been taken at the sports ground in c1911 as part of the celebrations for the Coronation of King George V and Queen Mary. 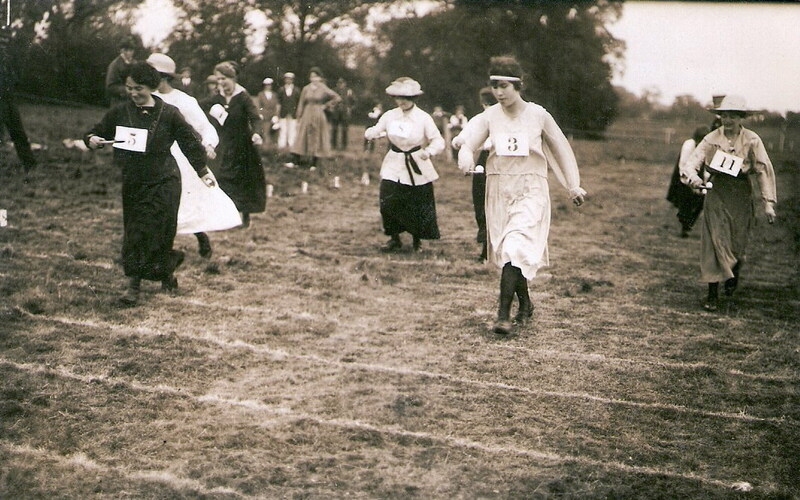 © c1911 A ladies gentle competitive egg and spoon race. 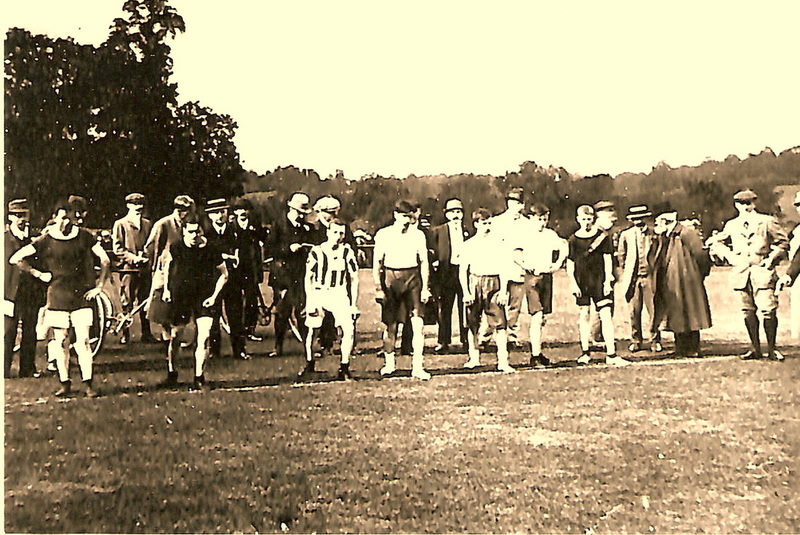 Once established it soon became customary for the club to hold an annual sports day, usually in July. This event included races over a range of distances as well as a two mile walking race, high jump, and throwing a cricket ball. Participation was open to both men and boys. Prizes were awarded to the winners, usually donated by the gentry of the village. Mrs Finch of Red Hall was known to have been generous. A rifle club was formed from members of the Dickinson’s staff and a rifle range was made available close by to the mill. Other team sports soon followed. Once suitable pitches had been established for football and cricket, teams when good enough were accepted and challenged other local villages. Eventually they became sufficiently accomplished to join in league games. Having to travel further afield, hiring transport - probably a local horse-drawn brake - would be necessary. The teams, full of enthusiasm, were apparently so good that in the initial stages they won every game they played. Their ‘manager’ considered them worthy of beating any team in Hertfordshire and that it was possible they could win the County Cup! The local lads from the 'Old Boys' school, opened in 1894, soon found suitable areas to 'kick a ball about' and with the enthusiasm of the first headmaster, Mr. Hanes, were able to join local area competitions. Cricket and swimming opportunities soon followed, encouraged by Neggy Wilson who took over from Mr. Hanes. The sports ground opposite the Red House public house became unavailable in the early 1920's.The land was acquired for the Metropolitan Railway from Moor Park to Watford Park via Croxley Green which opened in November 1925. The mill once again found and acquired a suitably sized ground that could accommodate these established sports. Land just off The Green known as 'Ollings' was purchased and became Dickinson's Sports Ground. It has been spoken of very highly and proudly that the original club house was uplifted by means of poles and 'walked' to the new grounds. One wonders how long it took and how many men were involved. The advantage was that motor traffic was very scarce at the time and there were no buildings of consequence to hinder the way. The increase in population due to the house building expansion in the 1930's gave rise to a wider range of sporting activities. The Guildhouse in New Road enabled a variety of indoor sports such as badminton and darts. Now established as the new village sports facility, an opportunity arose to give the new sports ground entry from The Green a grand appearance. 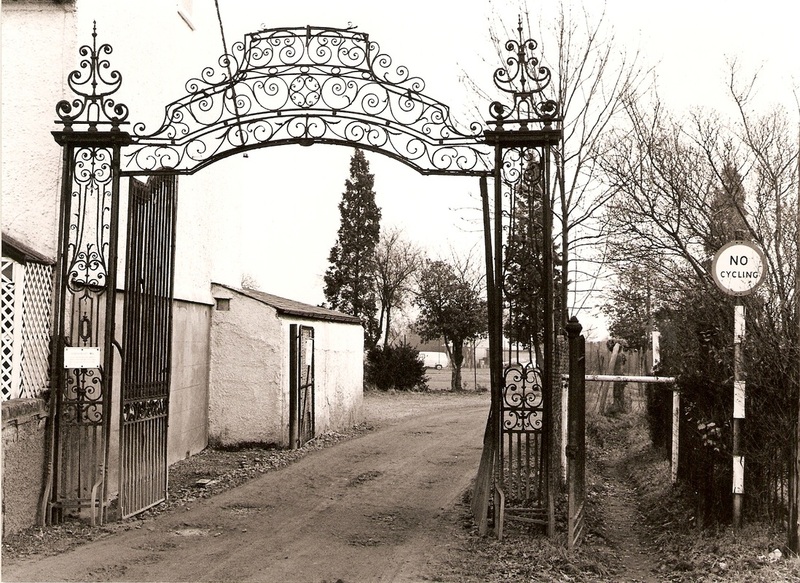 Following the sale of land belonging to the Durrants estate for housing development in the 1930's, elaborate wrought iron gates beside one of the Lodges in Baldwin’s Lane became available. An account many years later in The Watford Observer newspaper stated they were purchased by a previous owner of the estate, Mr. Thomas Hoade Woods, when he was a director and partner in the firm of Messrs. Christie, Manson and Woods, now Christie's art auction house in London. It was also reported he had acquired the gates to enhance the entrance to the Durrants estate and had them shipped from Italy. Apparently, they had once stood in front of a Cardinal's house. Another belief that had been voiced, they had been retrieved from the grounds of Bishop Bonner living in London during the sixteenth century. He was associated with both Cardinals Wolsey and Cromwell and did actually make several journeys to Rome on behalf of King Henry VIII. Could he on one of these journeys have acquired these gates to elevate his own position when he was made bishop of London in 1540? Could these stories have some mixed relevance to each other? Following the death of Mr. Woods the Durrants estate was purchased by Mr. Charles Morland Agnew who allowed the Croxley Cricket Club to play on the grounds.The imminent break-up of the estate concerned the Club greatly, as it would lose the cricket pitch. It also realised that the gates might well be in jeopardy. However, once it had acquired permission for an alternative pitch in the Dickinson's Sports Ground, approval was gained to have the gates relocated at the entrance. With the onset of World War Two, when the village concentrated on survival, in response to appeals for scrap metal to support the ‘war effort’, residents throughout the area provided unwanted cooking utensils and other household implements for recycling into military equipment. The metal railings were removed from outside many residents’ homes and commercial buildings as well as the original cattle guards from around the commemorative trees and the First World War Memorial on the Green. The sports pavilion had been requisitioned as a children’s nursery. Intentions to remove the metal fencing enclosing the sports field and the recently installed prized gates were thwarted by protests from mothers concerned for the safety of children attending the sports pavilion. Mothers threatened to give up their voluntary work and stay at home if they were removed. A series of letters to the authorities expressed the seriousness of their intent, but a lady official from the Ministry gave them her assurance that the gates and fences would remain. As the war progressed, sporting activities in Croxley Green did not appear to be very active. However, once peace had been declared residents were soon endeavouring to get back to 'normality.' Despite rationing still being imposed for several years, sporting activities became one of the most popular leisure activities. Land in Baldwins Lane and off Barton Way was acquired by the Rickmansworth Urban District Council as recreation grounds. Following the closure of the John Dickinson mill in 1980 disposal of the sports ground occurred in 1983. Now owned by the Dickinson Robinson Group Ltd. (D.R.G. Ltd.) a Conveyance was drawn up to transfer the sports ground to TRDC for the sum of £1 in order to preserve its availability to the local community as a local open space for recreational purposes. However, to maintain the grounds a committee was formed and changes implemented for the grounds to be managed by the Guild of Sports. The popularity of the sports ground and its position increased the usage of the clubhouse and it was able to offer additional amenities. These included the provision of 'public house' facilities. 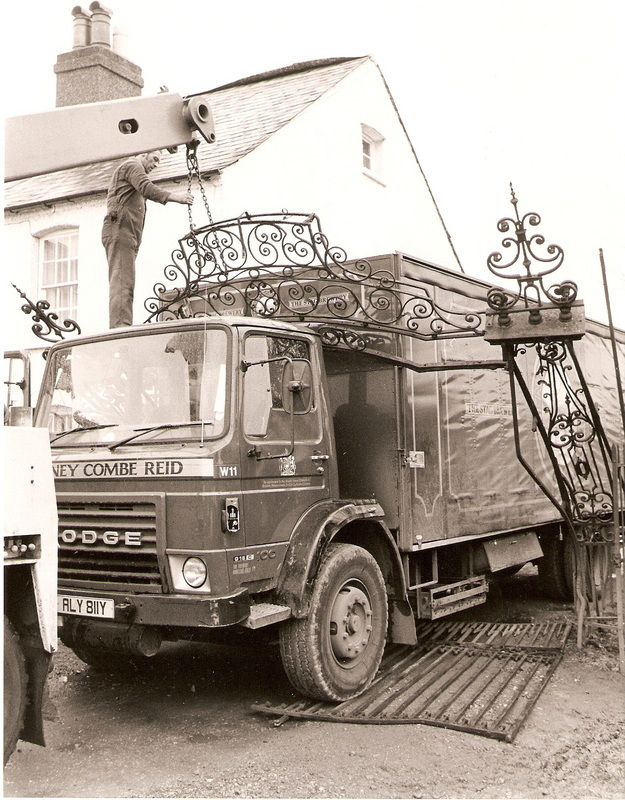 It was during a delivery by a very large lorry from the brewery that caused the precious gates to suffer huge damages. Coverage in the Watford Observer newspaper 11th February 1983 and the dramatic photographs taken by Harry Packman recorded the episode. The photographs show the vehicle leaving the sports ground and the gates/frame caught between the cab and the body of the lorry. The damage was so severe that a crane had to be summoned to lift the gates clear. One wonders how the lorry managed to enter the grounds in the first place. 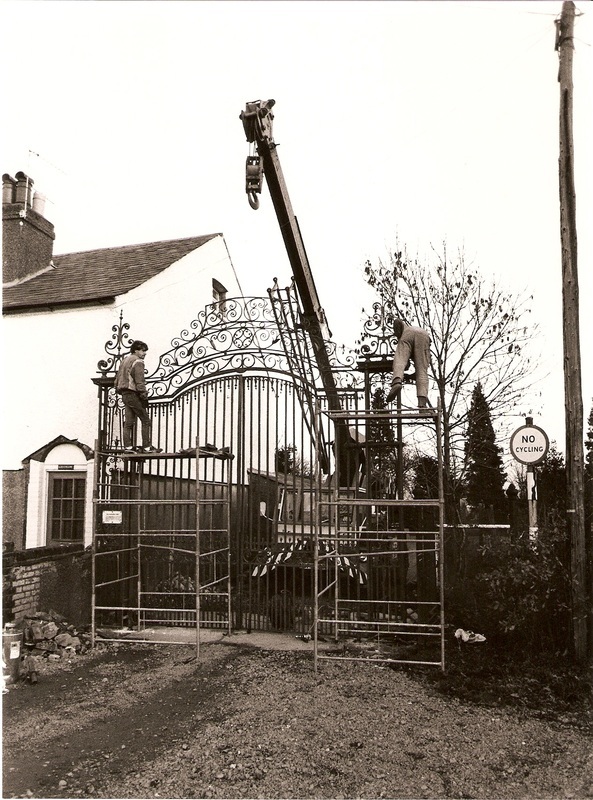 A firm from Nottingham, Period Ironwork, specialists in repairing historic gates, were commissioned to carry out the restoration. The damage was so serious it was initially considered they would have to be scrapped. Nonetheless they were returned three and a half years later at a cost of £4,000. The company remarked that it was inconceivable to imagine the gates had come from Italy due to their sheer weight. It took six men to lift just one gate and the arch weighed as much again. 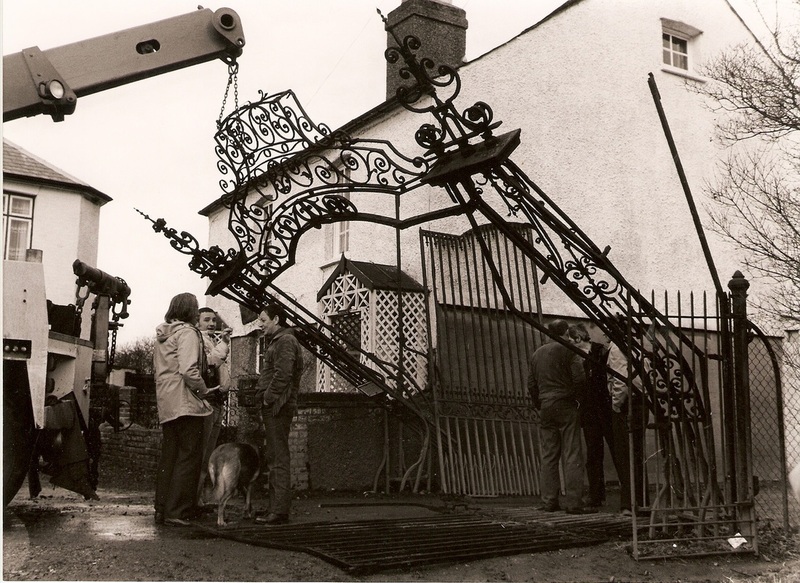 The gates were to receive another blow when, just eighteen months later in May 1988, the ornate gates were damaged again in unknown circumstances late at night. It was believed at the time that another lorry making a delivery to the club drove into the gates in such a way as to cause the exit to be blocked. One of the gates had been taken off its hinges and laid on its side whilst the second one had been pulled back. Once again in time they were restored. Nowadays school grounds provide opportunities for their pupils to experience a wide range of sporting activities, especially for a combined 'sports day' where they might have once used the Dickinson's sports fields. 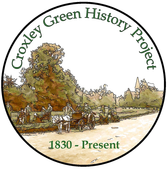 Indeed, there are now many opportunities for the young and old to continue and participate in a variety of sport-related activities in Croxley Green. Added to those already mentioned the sports ground offers bowls, tennis, rugby and football. The sports field is still the main community-based facility. A skateboard park in part of the Baldwins Lane recreation ground was opened during the mid 1990's and proves to be very popular using a variety of skateboards and BMX bikes. 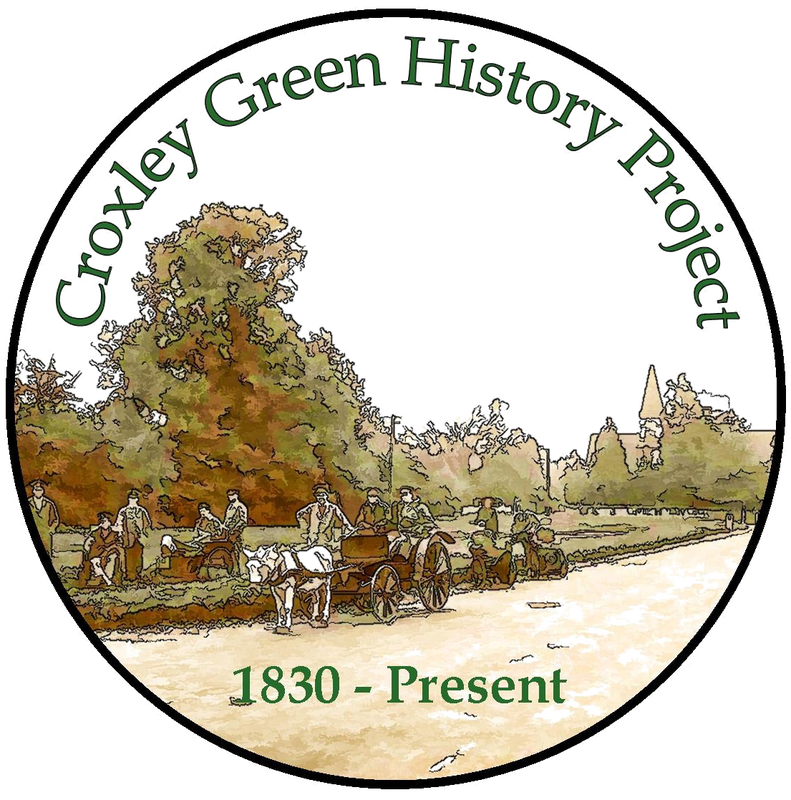 The categories listed may not cover all the groups and clubs that have played a part in the sporting history of Croxley Green. It is a subject that has not been widely documented so any contributions to this section would be appreciated.